Angus King, formerly governor of Maine and now an industrial wind developer, had an opinion piece published in Sunday's Portland Press Herald. It is a response to letters pointing out some of the shortcomings of industrial wind turbines that must be weighed against their alleged benefits. Rather than acknowledge such impacts in any way (a signal that the benefits side of the argument isn't at all viable), he engages in the classic rhetorical devices of straw man, red herring (changing the subject), ad populum (weasel words), and simply lying. 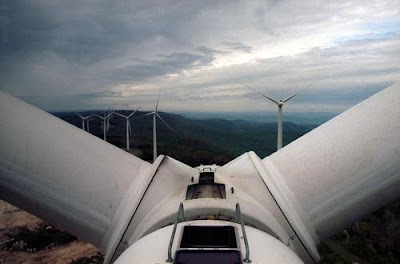 "Myth" 1: Building wind turbines destroys mountains. King: Mountaintop removal for coal destroys mountains. King actually asserts that since nothing in the blasting and grading for roads and platforms is removed from the mountain, it's not destructive. "Myth" 2: The sound can be heard for miles. King: Half a mile maybe. Evidence of harm from noise experts and physicians suggests that noise from a line of turbines on a mountain can be a problem 3-5 kilometers (~2-3 miles) away, depending on the terrain. They suggest a minimum setback of 2 kilometers (1.25 miles) on flat terrain. In contrast, while half a mile is more setback than most developers will allow as reasonable, it is not based on actual experience, where in fact, the sound -- to a degree that is harmful to health -- can be heard a mile or more away. "Myth" 3: Maine's wind power law cuts the people out. King: There were public meetings. There is a political imperative behind industrial wind, which even the environmental groups cited by King support. Combined with the huge amounts of free (i.e., taxpayer-supplied) money involved, serious limitations on that development were inevitably kept to a minimum. The fact is, the purpose of the wind power law is indeed to make it easier to erect giant wind facilities, which requires cutting the people, and the environment, out. "Myth" 4: Wind turbines will make you sick. King: Only annoying, if you're too close. Again, this is more than most developers will admit, but it is still insulting, misleading, and false. Insulting: King is calling everyone who suffers very real effects of ill health, many of them forced to sleep elsewhere or to abandon their homes altogether -- he is calling each of them a liar, an hysteric, a believer in "mysterious emanations". Misleading: Annoyance is in fact an acoustical term meaning the noise is bad enough to trigger drastic action (such as suing or moving). These actions are common around wind energy facilities. Many of them result in the company buying the neighbor's property (and forbidding them to speak of their problems ever again). Acoustics is not a field of medicine, so it can only imply that annoyance could also be caused by or is a predictor of health effects. There are no journal-published studies by physicians of this issue. False: What is "too close"? The most rigorous case series to date, by Dr. Nina Pierpont, documents serious adverse health effects (as proven by the need to abandon the home, which action cured the symptoms) up to 4,900 feet (almost a mile). Others report health effects up to 2 kilometers (1.25 miles) away. The "annoying" effects are not simply irritability and anxiety, but also include headaches, nausea, dizziness, memory and concentration problems, and throbbing sensation. Studies of wind turbine noise in Europe consistently find, even with models that are much smaller and distances which are much farther than in North America, that wind turbine noise is uniquely annoying -- at lower sound levels and at greater distances than expected. "A Dangerous Dependence": Finally, King raises the specter of fossil fuel use and appeals to xenophobia. Self-sufficiency and cleaner fuel use are indeed worthy goals. 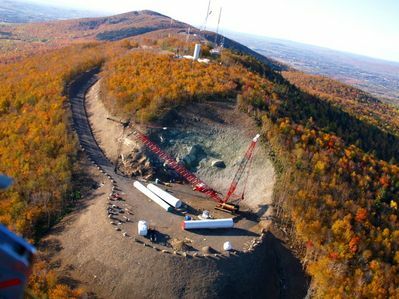 What King neglects to show is any connection between industrializing Maine's mountains with giant wind turbines and achieving those goals. (Furthermore, Maine wind is eyed for the supposed benefit of Massachusetts and New Brunswick, not Maine.) Conservation would obviate the small amount of low-value (intermittent, highly variable, and nondispatchable) energy that wind could ever hope to provide. It is important to note that there are limitations to our study, primarily because it is a case series. Therefore, we have no comparison group and there may be selection bias, though we attempted to minimize this by reviewing our entire endoscopic database and selecting all patients who underwent this procedure, not just a subset. Although this is the largest series presented to date, it still comprises only 12 patients, all of whom were seen at a single GI referral center with expertise in esophageal dilation and treatment of esophageal strictures. Therefore, the results may not be generalizable to other settings. Those "limitations" did not prevent it from being published in a peer-reviewed journal. They are normal. It is important to note that authors typically suggest the reviewers for their papers. It is not adversarial, as detractors seem to imply. Successful peer review just means you've been able to hold up your end of the conversation, not that you've slain all skeptics. It is more a process of refining the paper, as I believe Pierpont did with her panel of reviewers (and why in part it took so long to get into print), whose reports are on pp. 287-292. In turn, most journals also include a lively letters section in which the real peer review is shown to begin after publication. Choosing the most effective expert witness must of course be done according to each case's focus and strategy, but I dare say, opposing counsel would have a lot harder time undercutting Pierpont's work than they would that of most "peer-reviewed experts". In other words, "peer reviewed" is not a defense. Conversely, lack of one form of peer review (that for journal publication) is not much of a charge. A court room is perhaps the ultimate peer review. These comments are in response to some of the reactions to Wind Turbine Syndrome that have been written. There is no question of WTS, whether you call it that or not. There remain questions of mechanism, but not of cause. And determining its extent and risk requires large epidemiologic studies. These are not criticisms. Pierpont says them herself. That is the process of science. If only more people in power were so skeptical about wind industry claims! With Eve at home atearing her hair. His life now and ever a boon vacation. And gathers food, Lilith to see. To Eve — who with Cain has moved to town. Are you not the son of Manannan Mac Lir? And people? Wake! child! your fate is rising before you. Shuffle the deck and read the signs once more. Away, and you are at the origins of something new. That shape our morning and lead us where you will. Mother turbine gives birth to industrialization of Backbone Mountain, West Virginia.